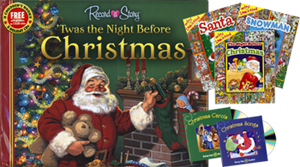 Glenda Cates at Usborne books is giving away 1 copy of 'Twas the Night Before Christmas Recordable Storybook to one lucky TwinkieMommie reader as part of Mom Audience’s Blog Explosion. 'Twas the Night Before Christmas Recordable Storybook by Clement Moore: Create a keepsake storybook by following the simple directions to record your own voice reading this treasured Christmas classic. The book is re-recordable and has a lock feature so that your special recording is kept safe, even when the batteries are replaced. Beautifully illustrated with sturdy board book pages, this is a unique gift made by you - and is sure to be treasured! I miss going to airshows, but when we went they sure didn't cost that much to get in. That is too expensive. Military families don't make much money and deseve more than they get. I follow you on GFC; hope you will follow me back. I subscribe to Mom Audiences Newsletter also. Following you via GFC (shay) and subscribe to Mom Audience's newsletter. Like Houston Parenting Multiples Examiner on Facebook. I became a TwinkieMommie GFC follower and already subscribe to Mom's Audience Newsletter. I am a new GFC follower = christine and I already subscribe to the mom audience newsletter at justicecw@hotmail.com Thanks for the chance.